To get an idea of how much Chris and Quinn LaMorte of Ocean Township, N.J., love their 2011 Skater 36 catamaran consider this: They sort of honeymooned in it. The couple tied the knot near their Garden State home on New Year’s Eve in 2015. The following day, they ran their 36-footer, which is powered by twin Mercury Racing 700 SCi engines, in the Joey Gratton Memorial New Year’s Day Fun Run in Sarasota, Fla., where the LaMortes keep the boat in the winter. Until recently, Chris and Quinn LaMorte thought their 36-footer was the only Skater catamaran they would need in the foreseeable future. Photo by Pete Boden/Shoot 2 Thrill Pix. If that’s not love, I’m not sure what is. Since then, they have run the cat in a slew of events and—by both of their accounts—have been delighted with it. They repowered the boat with its Mercury Racing engines about a year after they married and it has kept them more than satisfied. 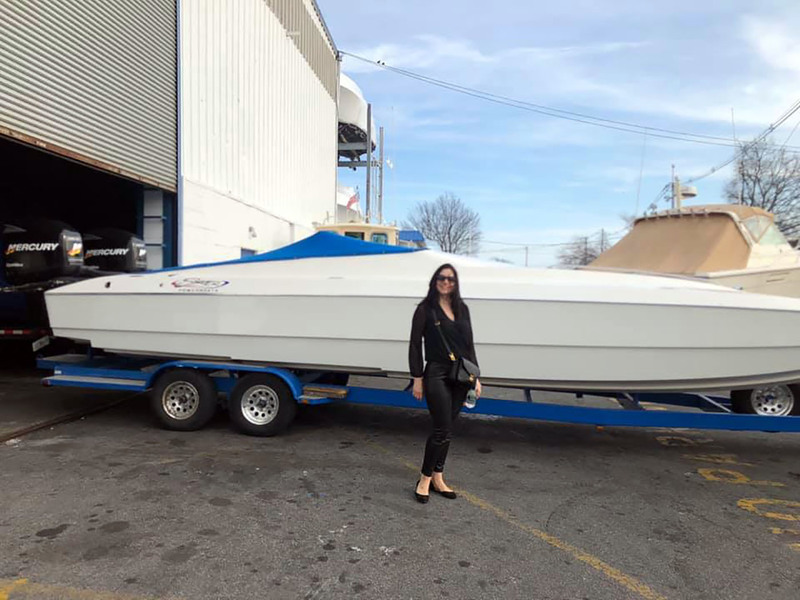 They certainly didn’t think they needed another Skater catamaran, at least until a 28-footer powered built in 1994 and powered by Mercury Racing 250XS outboards came on the market in Long Island, N.Y., about a week-and-a-half ago. “A buddy of mine was looking at it but decided it wasn’t the right time for him,” said Chris LaMorte. “But the price was right for us and being a diehard Skater fan it was right up my alley. Like her husband, Quinn LaMorte was attracted to this vintage Skater 28 catamaran for its simplicity and ease of use. LaMorte paused, then laughed. “She’s already calling it her boat,” he said. Like her husband, Quinn LaMorte was immediately drawn to the outboard-powered Skater 28 for its simplicity. So now the LaMortes have two Skater cats, or at least they will when they pick up their 28-foot classic this weekend. Quinn and Chris LaMorte are now a two-Skater family. Photo by Pete Boden/Shoot 2 Thrill Pix. Their immediate plan is to keep the Skater 28 in storage on its trailer near their New Jersey home. Currently at its winter home in Sarasota, the 36-footer will head to Appearance Products in Grand Rapids, Mich., for interior refreshment in the near future. That may mean they campaign their Skater 28 cat in the Jacksonville River Rally and Poker Run in May, which is the next event on their boating schedule. 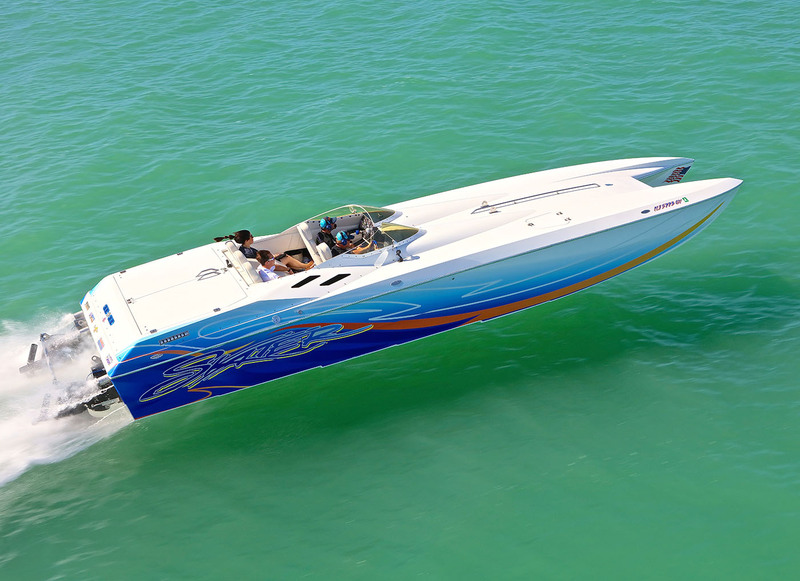 Chris LaMorte said he’d eventually like to repower the Skater 28, which reportedly tops out at 100 mph, with newer outboards such as Mercury Racing 300R V-8 models. He also said that the 28-footer would be the ideal boat to have on a lift behind a waterfront home he and his wife hope to own someday. In the meantime, they have the best of stern-drive and outboard-power worlds. And from time to time, they’re going to be glad they have both Skaters at their disposal.